I usually don’t write the Giants blog but editor-in-chief J.D. Cook had other commitments during the Giants-Eagles game on Sunday. 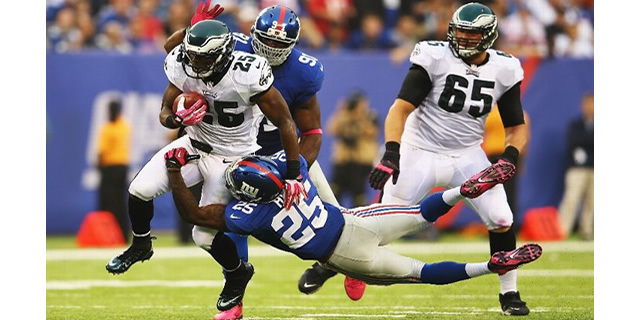 It is also interesting that it was this very Philadelphia Eagles at New York Giants matchup that sparked my first Tuesday Morning Tailback article three years ago. Watching yesterday’s game, I was stuck by how many of the same skill players from both teams were on the field when I wrote that first article in December 2010, but yet everything (except for the game result) was so different. The theme on that day was the absurd bandwagon that all the NFL “experts” had seemingly jumped on, proclaiming the Eagles as the definite favorite to go to the Super Bowl following the “Miracle at the New Meadowlands” where Philadelphia rallied from 21 points down to win. I found the whole “Super Bowl” talk absurd and it was as the Eagles dropped three straight and promptly out of the playoffs. Still, the hype did not cease as the Eagles were labeled the “Dream Team” heading into the 2011 season. The New York Giants won the Super Bowl and Eagles did not even make the playoffs that season. Less than two years later, what a different world we are now in. It would be easy to dump on the Giants and there 0-5 start, but I will not. All I will say is that it is unfortunate they don’t have Jacksonville on the schedule this year. The optimistic view is that they are still only 2 games out of first place with 11 left to go. Is it really possible to redeem this season? The Giants Blog is published every Monday during the NFL season while the New York Giants remain viable contenders (which in 2011 was right to the end and their Super Bowl championship). 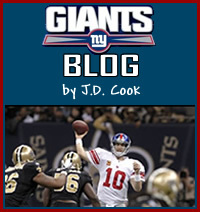 On the weeks when the Giants have a Monday night game, the blog will be published on Wednesday. The blogs are thoughtful (albeit heavily biased) analysis of the Giants’ performance from our editor-in-chief and Giant fanatic J.D. Cook.